Our next General Committee Meeting is on Saturday 1st Septmeber 2018 at 11:00am, Robert Lodge Whitehawk Rd, Brighton BN2 5FG. Attached to the email sent to all members you will find an agenda, the minutes of the last meeting and any motions recieved so far, note that the deadline for motions to be considered by the meeting is Sunday 26th August at 23:59. This meeting will be a chance to discuss conference, meet the delegates representing us this year and talk about how you want your views represented at Conference 2018. Please be reminded that any member can come and observe General Committee Meetings, however only delegates, as voted for at branch meetings, can vote. 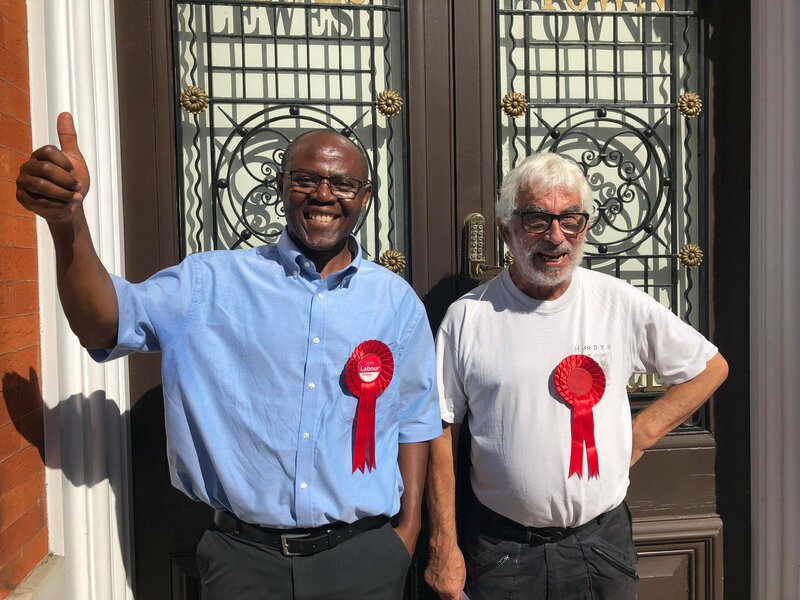 Two new Councillors in Peacehaven East Claude Cheta and Alan Milliner. We exceeded our expectations by concentrating upon door knocking. Thanks are due to members from Seaford and Newhaven who assisted greatly. In May 2019 all District and Town Council seats will be contested. If anybody works in the area or lives within 3 miles they would be eligible to stand for a Council, please contact the branch if you are interested in serving the community. Two new Labour councillors for Peacehaven East. Throughout July and August, the Labour Party in Brighton and Hove have been selecting candidates for the 2019 local elections. Members have been choosing who they want as their representatives and here in Kemptown, we have some fantastic representatives ready to stand in the 2019 local council elections, voted for by us the grassroots membership! Many many months ago when Nancy Platts was holding and arranging fund raisers for Lloyd’s organiser fund the Meridain secretary arranged a date for the Labour Party to run a Car Boot Sale at The Dell, South Coast Road (junction with Sutton Avenue) Peacehaven on Sunday 19th August from 8am to 12:00. We are responsible for hiring out pitches for cars to sell from and arranging the car parking within The Dell which is a Recreation Area. This is an opportunity to help with the car parking and hence fund raising for the MP’s organiser fund or if branches wish they can have a stall to sell anything they want. Obviously individual members can have a stall as well. £7 /car or £10/ van. If anybody can help with the car parking that would be great. If you can help out, please contact the branch. There is something about the weekend that, for many people, demands a delicious cooked breakfast. It’s something that the volunteers at the Bristol Estate Community Cafe have been delivering, every weekend, for the past couple of years. Locals like Keith come for the freshly cooked food, a read of the newspapers and the stunning view across East Brighton, and Sheryl, who brings her dogs and sits outside chatting with other neighbours. Over the past few months, the dishwasher, void of feelings for the humans it serves, has decided to stop working. This causes issues during busy periods. The community has raised some money for a new one, but need to raise more, or find a friendly person whomight be able to donate a dishwasher. If you can help, please email curtis@eastbrighton.org or drop into the Cafe at the weekend between 9:30am and 12:30. That’s your round up for August.